Recently, people have noticed that I’m sort of, um, preoccupied, with the upcoming women’s conference. Have you heard about it?? No?? Well, it’s going to be fantastic! The fifth annual Catholic Women Rejoice conference is happening Saturday, August 20 (that’s in, um, TWO weeks) with Author and blogger Hallie Lord, blogger Mary Lenaburg, Blessed is She Founder Jenna Guizar, best-selling Author, Blogger, and The Visitation Project co-host Rebecca Frech, and Archbishop Alexander K. Sample. All the cool kids will be there! Register today! End commercial. Anyway, the bags under my eyes are carrying their own luggage these days, and I’m not quite my usual perky self. The to-do lists have birthed multiple longer to-do lists, and while the work is beyond plentiful, the laborers are excruciatingly few. “Are you getting enough sleep?” No. “Why do you keep doing this to yourself?” Because. “You have young kids at home!” Yep. “It’s so much work.” Amen. “Women are too busy to go to something like this, anyway.” Um, really? My friends, the very best reason to do something is because God asks you to do it. A close second is because the devil doesn’t want you to do it and whispers in your ear that what you’re doing isn’t worth it, and you’re not worth it, and the women who will be served aren’t worth it, and it’s just a big hassle, and you’re underqualified and crazy and you should just give up. Apparently God made me extraordinarily stubborn for such a time as this, because I will NOT quit, and I will NOT give up. Time after time, God has shown me that women absolutely do need opportunities like this. They need space for community, for fellowship, for encounter. For praise. And, like the little boy giving Jesus what he had to help feed the crowds, I believe God can take what precious little I give and use it to bless and heal women, their families, whole communities, and our broken and beautiful world, all for His greater glory. “You know what causes that, don’t you?” as we shop with our children in the grocery store. “How come you let a bunch of old men in Rome to tell you what to do?” as we engage in the workplace. “Why aren’t you taking more time for yourself and going on some exotic vacation?” as we pursue social media. “Why do you need to confess your sins to a priest?” as we chat with our friends. “Isn’t it enough to just be a good person?” as we talk with our neighbors. “Live and let live, man,” as we’re told by our legislature. Time after time our culture tells us: “That may be your truth, but it’s not my truth,” and, my favorite: “Be more tolerant,” as society drifts further and further away from the actual Truth. Between you and me, as a Catholic woman, I have felt very alone in our society. I have felt isolated. I have felt extremely discouraged. I have believed the lie that I am the only one trying to do this work – this beautiful, difficult, amazing work – that Catholic women do. I have cried myself to sleep, wondering *where my people* were, and whether I would ever find them. Eventually, though, I decided to quit complaining and do something. Since there wasn’t anything happening in my area where a big group of Catholic women could get together and be joyful about being Catholic women, I was going to start something. And so, with no money, no location scouted, and no speakers booked, I began planning the first general Catholic women’s conference in the Pacific Northwest with nothing but faith, hope, and a telephone. I didn’t know if anyone would show. But they did. And they kept coming back. Catholic Women Rejoice and other conferences like it exist because someone decided to take a chance on the idea that women need a place (even if it’s only once a year) to gather together outside of Sunday Mass and know that we are most certainly not alone, that who we are as women matters, and that the gift of our common Catholic faith is something for which we should rejoice! At a typical Catholic women’s conference, participants are free to be fully themselves without fear or worry. A woman can bless herself and her food before eating and no one will give it a second thought. Another can nurse her baby while enjoying a conversation. Someone can be comforted in her struggles with infertility. Another can discuss the Pope’s latest encyclical, or the Church’s teaching on Natural Family Planning. Still another can steal away to the Adoration Chapel for a few quiet, distraction-free moments with Jesus. No one will be accused of being a Papist. Or a bigot. Or an idol-worshipper. Or a hater. Or a breeder. Or a weirdo. We can celebrate Mass, go to confession, and pray. We can sing, laugh, and praise. We can ask Mary and the saints and each other to pray for our needs. We can eat good food that is still warm that we didn’t have to prepare ourselves. And, you know what? We can have FUN. You know, like, smiling ’til your face hurts, laughing ’til you can’t breathe anymore, fun. I honestly believe that Catholic conferences and events uplift women and reinvigorate them to go back into the world and do God’s will through their individual vocation*, whatever it may be. They remind us that we are not alone in this work. They remind us that we are Catholic. And that we are strong, resilient women – wonderfully, fearfully, and beautifully made. And because of these things, we are free to truly rejoice. 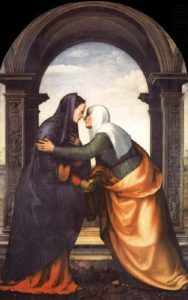 And so, as I continue to wade through my myriad to-do lists, I am praying for all the women who will come to Catholic Women Rejoice, or any other conference, for that matter, that in that time and space with their sisters in Christ, they will encounter Jesus and emerge renewed and transformed. And after that? After that I’ll sleep. *Whether a woman is a stay-at-home Mom, a career woman, a single woman, a religious, a work-inside-or-outside-the-home Mom, discerning her vocation, not a Mom, retired, a full-time volunteer, an Auntie, Grandma, high school student, college student, or any other iteration of Catholic woman of goodwill, she is welcome at Catholic Women Rejoice. Thank you so much for all of this. Your heart and all the work you put into this. You are so wonderful and I’m so thankful you won’t give up. Oh, gosh, Kaitlyn – thank you so much. It is all because of God. I couldn’t do anything – ANYTHING – without HIM! I just continue to pray that I get out of His way and work for His glory and not my own. Easier said than done, sometimes, but I’m trying! <3 Keep fighting the good fight, sister!